Welcome to Down On The Street, where we admire old vehicles found parked on the streets of the Island That Rust Forgot: Alameda, California. There's no end to air-cooled VW Beetles and Transporters in this series, but the Type 3s have been quite rare; in fact, so far we've had just this '73 Squareback and this Karmann Ghia Type 34. 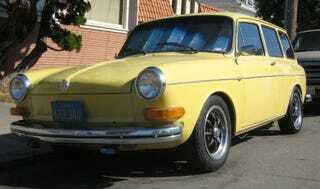 Now I've managed to add another '73 Squareback, and this one has the rare automatic transmission. The Type 3s just weren't as beloved as the Beetles over the long haul; sure, many more Beetles were sold here, but that still doesn't fully account for the rarity of the 3s now. As for the 411s and 412s, I haven't seen one of them on the street for many years. In 1973, you could get yourself a new Squareback for $2,995, exactly the same as a Datsun 610 wagon. That price was also about $650 more than you'd pay for a new Chevy Vega Kammback wagon and $600 more than a Pinto wagon. The Fiat 124 wagon's price tag that year? $2,795! The Vee-Dub weighed just 2,217 pounds, which was a good thing… considering that its 1600cc engine made only 52 horsepower.